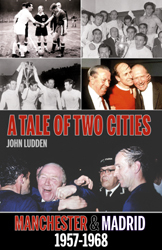 Buy "A TALE OF TWO CITIES"
When United’s Busby Babes lost to reigning European Champions Real Madrid in the 1957 European Cup, the pair seemed certain to be rivals for years. Within a year however the Munich Air Disaster had ripped apart Manchester’s pride and joy. In the years that followed Real did more than any other club to help United recover - agreeing to stage a series of friendly matches as Real completed their now legendary five European Cup victories in a row from the inception of the tournament. Following the Mancunian side’s recovery, the clubs met once more as United’s battled through to the 1968 European Cup semi-final. This a unique football tale of a friendship born of tragedy and a club’s quest for redemption. John Ludden was born and raised in Moston, Manchester and spent his formative years obssessed with football and writing to the extent that as a kid he used to write reports of Match of the Day. A former builder, John was inspired by the likes of Hugh McIlvanney to write several acclaimed books on the game including Fields of Fire: The Greatest Football Matches Ever and Once Upon a Time In Naples about Diego Maradona's time in Italy. His work has been translated into several languages. Of a 'A Tale of Two Cities' John comments, "I was fascinated with how United came back after the Munich disaster. How just ten years after the crash they actually fi nally won the European cup. Also it was a chance to write about the team whom I regard as the greatest ever; the Real Madrid team of Di Stefano, Puskas and Gento. They were not just wonderful players but great characters. The opportunity to tell both stories in one book proved too good an opportunity to let go. I just hope I have done it justice."